"Chicken wrapped around tomato-basil feta cheese--simple, succulent, and sensational." Spread 2 tablespoons bread crumbs in the bottom of the prepared baking dish. 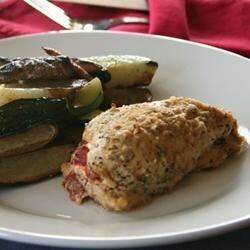 Arrange chicken in the dish, and top with remaining bread crumbs. I got lazy and just cut a pouch into the side of the chicken breasts and stuffed the feta in. Turned out very well. A very easy, quick dinner. Thanks.